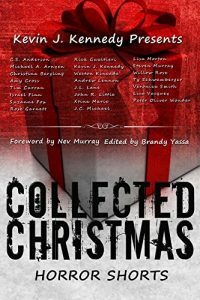 Number one in the Amazon UK and US horror anthology best-sellers list, December 2016. Goodreads review: Horror is my favorite genre. Christmas is my favorite holiday. You usually don’t put two and two together. But when I heard that Kevin was coming out with a book that would combine the two, I knew right away I wouldn’t be disappointed. And I was right! You want scary? Read this! You want hide under you covers good? Read this! You want a book so complex, intriguing, and terrifyingly intense you have to read it twice? READ THIS! Each story presented something new for me to scream about. If my heart didn’t feel like it was going jump out of my chest, I was gripping my covers with anticipation to see what scary and terrifying thing happened next. This book of horror stories was simply amazing and I am beyond thankful I got to read it! Well, twice. I read it twice. Because it’s that good!